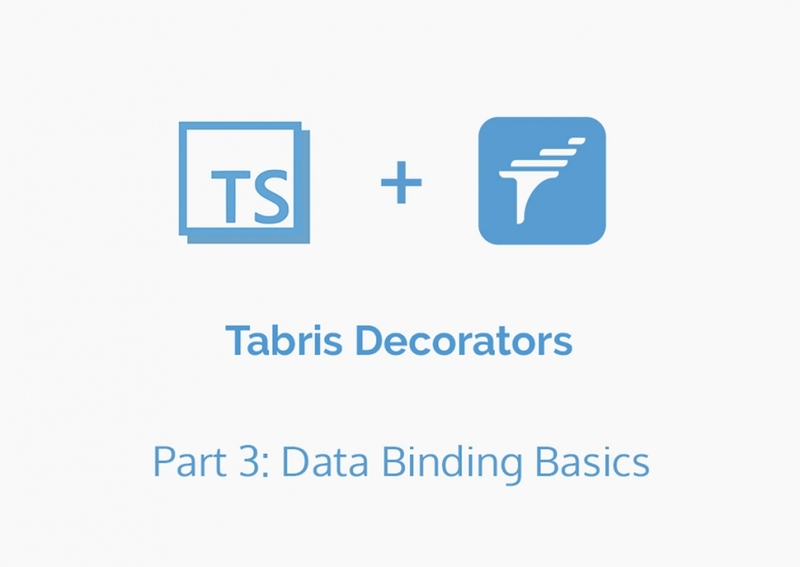 In this article, we will cover how TypeScript decorators are used in the Tabris Framework to enable data binding for UI Components. It is a part of the blog post series dedicated to the Tabris.js extension called tabris-decorators, which makes developing mobile apps with Tabris.js 2.x and TypeScript more convenient. The extension features data binding capabilities, enhanced event handling, and dependency injection, explicitly designed for the Tabris mobile framework. It’s recommended to read the previous posts in this series, though you may skip the first one. If the labelText property was final (cannot change after widget construction) it could be set via constructor parameter. But that would mean that any changes to the labelText after a widget construction, would have no effect on the actual textView element. Data-binding solves this problem. What we need here, is a one-way data binding which applies changes of the labelText property (the “base property”) to the text property on the “label” TextView (the “target property”). Since the TextView is not interactive, there is no need to have a “reverse” data flow that reflects changes on the target property back to the base. This makes the property eligible for one-way bindings. We could also initialize the property with the declaration, but in this case, we don’t really have a useful default value for it. And voilà: All changes to the labeledInput.text will from now on be applied to the “label” TextView. This is not all the @property decorator can do. It will pop up again in the next chapter on an event handling and in the second chapter on data binding. The text property would always provide the same value, even if the user has edited the text in the TextInput widget. The string given to the decorator takes a binding path which follows the pattern '#<targetWidgetId>.<targetPropertyName>'. Now, to prove that everything actually works, let’s write a mini form for entering your name. The result of the user input will be shown in a dialog. Components are initialized when append is called the first time. All bindings of any kind (i.e. one- and two-way bindings) are established at that moment, and appending any more widgets later, has no effect. This may change in Tabris.js 3. The IDE / TypeScript compiler can not check that the bindings will be valid, so no auto completion is available for this syntax. However, at runtime any invalid bindings will throw errors, they will not just fail silently. Binding to non-components (i.e. models or other widgets) is not fully implemented yet. We will discuss edge-cases and limitations in another blog post further down the road. 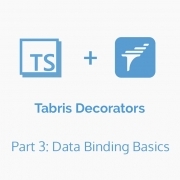 That’s it with the basics of the tabris-decorators data binding features . The next chapter will deal with an event handling, continuing with the same example class.